Truly, Fat Sal’s Deli can only be described as indulgent. It’s the mothership of food-crazy. 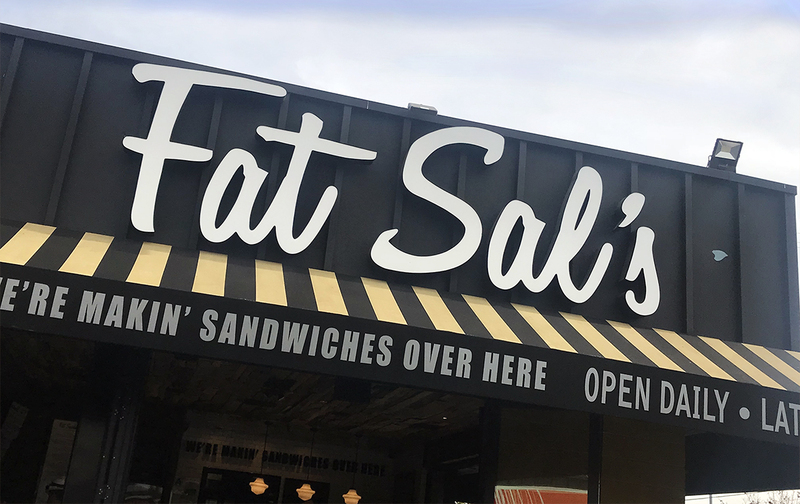 With locations in Hollywood, Westwood, San Diego, Austin, and Encino, Fat Sal’s does everything to put their customers first with over-the-top service and an over-the-top menu, built from only the freshest and best ingredients. Their shops are super inviting and fun — their staff is the same. Do not go here if you’re on a health kick, my friends. You go here for nothing but comfort food on crack and good times. I came to know of Sal’s through Instagram. Their menu is made for it. 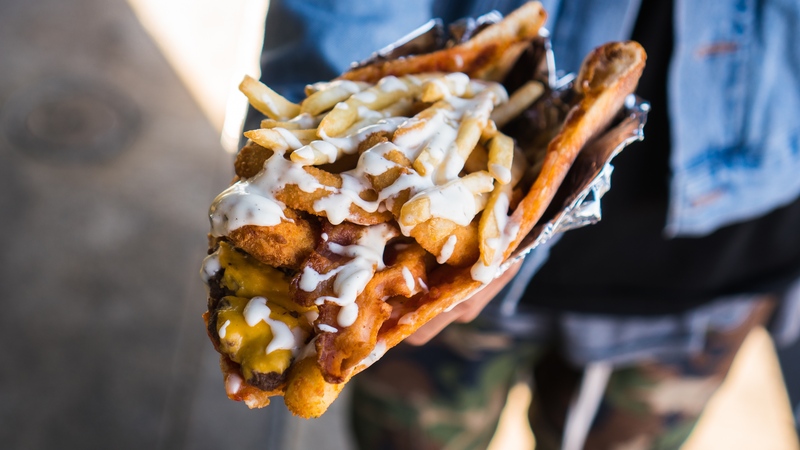 At a place where items on the menu includes a “Pastrami Western Burger,” “Bacon Cheeseburger Fries” and the “Big Fat Fatty” (this is a $50 food challenge you have to down in 40 minutes or less), you can imagine what kinds of things show up in photos online. So at the risk of crossing my arteries, I have just always wanted to try it. But I took it “easy” on my first visit. 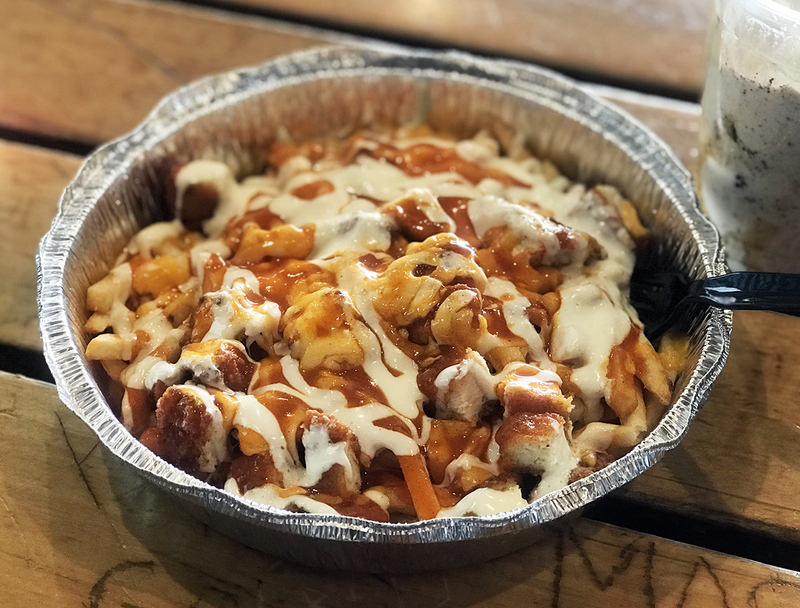 As a self-proclaimed connoisseur of French fries, I gravitated toward the Buffalo Chicken Cheese Fries which, in addition to fries, has chopped chicken fingers, melted cheddar and mozzarella, buffalo hot sauce and blue cheese dressing. I had to make sure the hot sauce wouldn’t be too spicy (I’m a pansy) and I was thankful it was more of a tangy wing sauce than something that’d burn my tongue off. And as much as I love fries, I gotta tell ya, what really got me on this dish was the chicken! It was cubed chunks, perfectly cooked, very tasty and if it was just those with the sauces, I’d be perfectly happy. They’re smart to serve it in a to-go container. Lord knows I could never finish that in one sitting (but kudos to those who can). But I was quite happy to come back to it the next day and find all the pieces of chicken I’d missed beforehand. I did require a tasty beverage to wash it down with, too, of course. And they are rather famous for their milkshakes so I did not mess around. I leaned right over that counter and asked for whatever is the most popular. 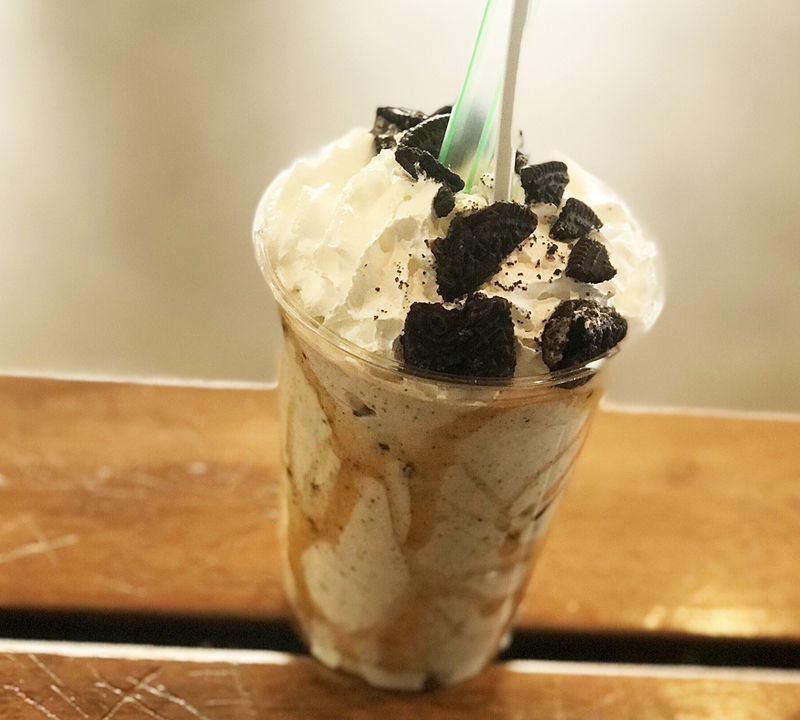 The #5 was alluring purely because it comes with a “whole slice of cheesecake” but I was secretly relieved when they told me the #4 is the most popular — it’s vanilla ice cream, oreo cookies, caramel and sea salt. Put sea salt on caramel on anything and I’m here for it.